Diesel versions of these vehicles are either on sale in the United States or due by year end. These vehicles are expected to have diesel variants in the next few years. Nebraska dealer Brian Hamilton still has flashbacks to the 1982 energy crisis, when half the Cadillacs on his lot came standard with General Motors' ill-mannered diesel engine. In cold weather, the fuel would become so thick that the engines wouldn't run, making the diesel vehicles a tough sell for Nebraska winters. Now, Hamilton is gearing up to sell GM's newest diesel model, the 2014 Cruze, at his Chevrolet stores. With a peppy turbocharged engine, clean emissions and a heater to keep the fuel from congealing, the Cruze diesel is nothing like its dyspeptic ancestor. But Hamilton knows he still has a tough sales job ahead. Even with today's cleaner diesels, he says, "there's a misunderstanding that they're smoky and loud." He expects to sell only a few of the vehicles at each of his dealerships. The future of clean diesels may be here, but memories of diesel engines' unsavory past haven't gone away. Reshaping perceptions has become a key marketing challenge for automakers and dealers as they prepare to unleash a new crop of diesel-powered vehicles on a public that still associates the fuel with a clattering motor, oily odors and tailpipe smoke. Marketers are divided on how to get buyers to consider a switch. Some are focusing first on debunking stereotypes of diesels, while others are addressing performance, extended range or fuel efficiency. 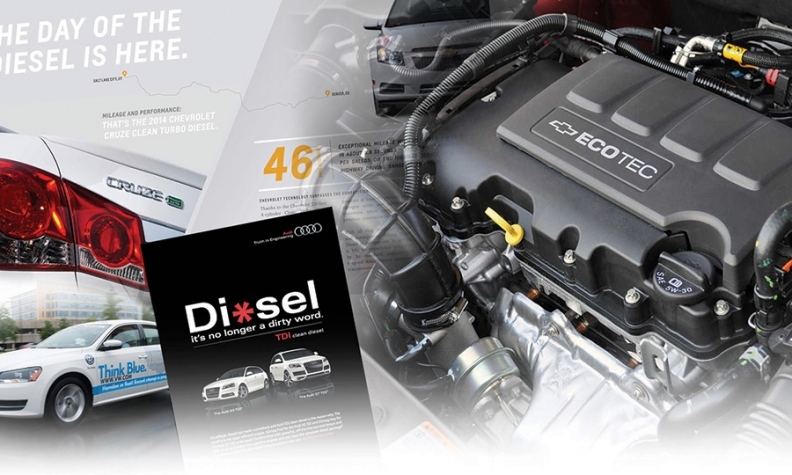 Clean-diesel vehicles represent a critical component of many automakers' product plans. That's because automakers -- especially those that haven't invested as much in hybrids and electric vehicles -- need the efficiency gains from diesels to stay on pace to meet new federal fuel economy standards that take effect for the 2025 model year. Diesels get roughly one-third better fuel economy than gasoline-powered cars but deliver more power than most hybrids. But a report by Maritz Research found that only 1.2 percent of U.S. buyers this year switched from a gasoline-powered car to a diesel car, a figure that has remained roughly constant over the past few years. "The stereotypical image consumers have of diesel as smelly and noisy needs to be overcome," says Chris Travell, Maritz's vice president for strategic consulting. It doesn't help that diesel fuel is available at only half of U.S. gas stations, according to the U.S. Energy Department, and usually costs more than gasoline, or that diesel cars are priced at a premium. The Cruze diesel, for example, costs roughly $2,000 more than a comparably equipped gasoline model, a Chevy spokeswoman says. Then there's the challenge of promoting diesel as eco-friendly, amid broadening competition from hybrids, electric vehicles and higher efficiency gasoline engines. Chevy is tackling the perception of the dirty diesel through a Cruze TV commercial called "The Cleanest Dirty Car," now running in 13 markets. It shows a mud-splattered car pulling into a test lab, where its exhaust comes out clean, with a voiceover saying, "It's good, clean fun." Otherwise, Chevy is playing it safe by strategically targeting buyers of the Volkswagen Jetta TDI, which has had a near monopoly in compact diesels in the United States. Later this summer, Chevy will send an invitation to Jetta TDI owners to try the new Cruze. The goal is to let Jetta owners know that "we've got a new vehicle to check out," says Phil Caruso, marketing manager for the Chevrolet Cruze and Spark. In addition, Chevy is reaching out to the 6 percent of its truck buyers who own a diesel, playing up the Cruze's torque, fuel efficiency and durability, perks for those who drive long distances in rural areas. Ed Kim, vice president of industry analysis for Auto Pacific, cautions that targeting diesel fans will go only so far. Many diesels are bought by those who prefer European products, he says, and persuading them to buy American may be difficult. What marketers such as Chevy need to communicate, he says, is the long-term value proposition for mainstream buyers, who want justification for paying thousands more upfront for a diesel engine. Steve Wilhite, former COO of Hyundai Motor America and former global marketing vice president at Nissan, says Chevy's TV spot, with its focus on dirt and tailpipes, only reminds potential customers of diesel's onetime drawbacks. A self-described diesel enthusiast, Wilhite argues that likely diesel buyers tend to be more informed about improvements in the fuel over the years, so marketers should exclusively play up the positives. Indeed, for the VW brand, which has long been identified with diesels, future advertising will focus "purely on the benefits," says Justin Osborne, general manager of brand marketing for Volkswagen of America. He says VW will be using owner testimonials to illustrate the advantages. The company also will be closely monitoring the Cruze's social networks for chatter about diesels vs. hybrids. "We're wondering if we will see an uptick in diesel discussions and if those discussions outnumber those focusing on hybrids," Osborne says. But at VW's sibling brand, Audi, which brought its first clean-diesel passenger car to the United States in 2008, the focus remains on shedding old baggage. Loren Angelo, director of marketing for Audi of America, says that buyers of its pricier vehicles -- its A8 TDI luxury sedan goes for nearly $80,000 -- tend to be older, part of a generation that lived through diesel's dark period, and they may need to be re-educated. Audi's upcoming campaign will allude to "what you thought diesel was: dirty and smoky, and show it's cleaner," Angelo says. Whatever message the marketing departments project, experts say dealers will have to play a critical role in getting consumers to understand diesel. "You can do everything right in your advertising and Web sites, but if the salesperson is uneducated and unenthusiastic, the whole thing breaks down," Wilhite says. Since many dealers have had little experience with the new diesels, "the more money they invest in dealer training, the greater probability of success for them." As it returns to diesel after three decades, GM is providing face-to-face training as well as video and online training to show its 3,000 dealers how diesel today differs from the old technology. "We have classes over the Internet, and salespeople and managers must pass tests in order to be certified to sell the Cruze diesel," says Hamilton, who owns Chevy stores in Kearney and Bellevue, Neb. Miles Brandon, owner of Capistrano VW in Capistrano, Calif., runs contests for a couple of months to spotlight diesel's mileage and range, each day putting a different customer behind the wheel of a clean-diesel car to see which one can rack up the best mileage. The leader so far got 61.5 mpg. Some participants were already familiar with VW's clean-diesel engine but wanted a shot at the cash prize of up to $1,000, Brandon says. "Others got to experience our diesel offering for the first time and came away extremely impressed."